Made up of eight major glaciers, this massive field of ancient ice is situated near the town of Jasper in the middle of Jasper National Park. The icefield covers 125 square miles (325 sq km) and in places is estimated to be 1,270ft (385m) deep. The icefield feeds four of North America's major river systems: the Columbia, Fraser, Mackenzie, and Saskatchewan Rivers. Its meltwaters flow into three different oceans: the Pacific, Arctic and Atlantic. 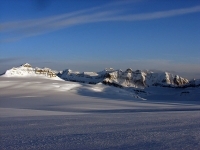 Tours of the glacier are offered on snowcoaches between April and October each year. Ice-walk tours are also offered by the Jasper Adventure Centre. The icefields are one of Alberta's natural marvels and a must-see for outdoor enthusiasts in the region. Of course, the Jasper National Park also has many other attractions and activities on offer.